On June 18, 2017, a U.S. Navy Super Hornet fighter shot down a Syrian government Su-22 attack plane after it dropped bombs on a U.S. allies. The shoot-down represented the latest escalation of tension between the United States, Russia and Syria. However, this was merely the latest in a series of violent encounters between the Soviet-made Su-22 and U.S. Navy fighters. The very first clash — between Libyan Su-22s and U.S. Navy F-14s — occurred in 1981. Ostensibly, the root of the U.S.-Libyan conflict lay in the concept of “freedom of navigation.” International law generally holds that any point more than 12 miles from land counts as international waters — and can therefore be traversed by any vessel, including military ships and planes. However, some countries make more expansive claims to nearby waters, even if they are not widely accepted. In the case of Libya, this followed the practice of maintaining that bodies of water engulfed by land, such as gulfs or bays, count as part of its territorial waters. In 1973, Libyan dictator Muammar Qaddafi asserted that the Gulf of Sidra, or Sirte, now counted as part of Libyan territorial waters. The Gulf forms a partial salient in the middle of the Libyan coast. Qaddafi declared that any violations of his “line of death,” which extended as far as 100 miles from the Libyan coast between the cities of Misrata and Benghazi, would be met with force. However, Qaddafi’s claim was not internationally recognized. The United States, which had a grudge with the Libyan ruler over his nationalization of the Libyan oil industry at the expense of U.S. companies, continued to operate ships and aircraft in and over the Gulf in order to assert its right to sail and fly their under international law. On March 21, 1973 two Mirage fighter jets of the Libyan Arab Republic Air Force intercepted a U.S. Air Force C-130 flying 75 miles away from the Libyan coast on a signals-intelligence mission. The Mirage pilots ordered the C-130 to following them back for landing in Libya, but the Hercules crew refused and took evasive action. Dodging cannon fire from the Mach-two fighter jets, the C-130 escaped into a cloud bank and made its way back to its base in Athens. Seven years later on Sept. 6, 1980, Libyan fighters fired at another SIGINT plane — an RC-135U, based on the 707 airliner. Again the U.S. spy plane escaped unscathed. U.S. president Ronald Reagan ramped up hostilities with Qaddafi due to the Libyan leader’s support for militant groups such as the Palestinian Liberation Organization. In 1981, Reagan ordered U.S. Navy to dispatch not one but two aircraft carrier task forces to perform missile defense drills about 100 miles off the Libyan coast in Gulf of Sidra to deliberately tweak — and test — Qaddafi. Knowing they would likely experience some push back, the carrier crews left behind non-essential aircraft at land bases so they could maintain at least two fighters on deck with engine warmed up ready for launch at all times. The fleet carriers USS Forrestal and USS Nimitz arrived off Libya on Aug. 18. The Libyan air force dispatched no fewer than 35 two-plane elements flying towards the carriers’ general position, including speedy MiG-25 Foxbat interceptors capable of flying three times the speed of sound. Just as the carriers were there to defy Libya, the Libyan fighters sought to intimidate the American ships. However, the Libyan jets — apparently attempting to determine the carrier’s precise location — were flying nearly blind as Navy EA-6B Prowler and EP-3 electronic warfare planes scrambled their radars and disrupted their communication with ground controllers. U.S. Navy fighters — older F-4J Phantom fighters from Forrestal and newer F-14 Tomcats from Nimitz — duly intercepted each of the Libyan two-ship elements. And each time, the Libyan fighters allowed themselves to be turned away by the American jets. Neither side intended to start a fight — though it was clear that one risked breaking out. At 6:00 the following morning, local time, the Navy decided to test the Libyan forces, and dispatched an S-3A Viking patrol plane under the command of Cmdr. Thompson Sanders to fly in an orbit just outside and parallel to the internationally-recognized twelve-mile territorial limit of Libyan air space. The S-3 had a crew of four and was designed for submarine hunting and maritime reconnaissance — but with a maximum speed of 500 miles per hour, slower than that of many airliners, it was not fast enough to evade a pursuing fighter planes. Furthermore, the S-3A model lacked a radar warning receiver, or chaff or flare decoys to protect against enemy missiles. Sander’s plane, call-sign Diamond Cutter 702, approached the Libyan coast at low altitude to avoid radar detection, then popped up to 10,000 feet, clearly visible on radar. “Just to see what would happen,” Sanders recalled. We immediately activated the direct layer control system, which deploys huge spoilers on top of the wings, eliminating almost all lift. The DLC is unique to the sub-hunting S-3, designed to allow us to descend quickly from high altitude, then attack a submarine before it can evade us. Or, in this case, try to evade Mach-two enemy fighters. Our 50,000-pound Viking dropped at 10,000 feet per minute. At 5,000 feet, we needed to start pulling out of our dive so we could level off at 300 feet without inadvertently “splashing,” which would have ruined our whole day. Our dramatic descent, and the resulting sudden loss of radar contact with Libyan controllers, was likely the source of Qaddafi’s later claim that his fighters had shot down an American aircraft. Meanwhile, speeding along at 450 miles per hour 300 feet over the gulf, fuzz-buster-less, we had no way of knowing if or when the Libyans had fired at us. Then again, as slow and defenseless as we were, we really didn’t want to know exactly when a missile might hit us. While Sanders raced his Viking back toward the American fleet, two F-14s from squadron VF-41 — call signs Fast Eagle 102 and 107 — were directed to intercept the Libyan fighters. The F-14, later immortalized in the film Top Gun, was one of the first fourth-generation fighters to enter service. It combined speed, maneuverability and sophisticated avionics. The carrier-based jet had wings that could swing outward for improved lift while taking off and tuck inwards for reduced drag to allow it travel well over twice the speed of sound. The radar intercept officer in the rear seat also benefited from a powerful AWG-9 radar that made the Tomcat very effective at detecting and intercepting hostile aircraft. The Libyan fighters were Sukhoi Su-22Ms — “Fitters” in NATO parlance. These were downgraded export-models of the Su-17M ground attack plane, which also had swing wings. Large, stable-handling and fairly fast with a maximum speed of Mach 1.7, the swing-wing attack planes packed twin 30-millimeters cannons and could carry numerous air-to-ground munitions. However, they could only fire short-range air-to-air missiles. The Libyan fighters approached within 300 meters of the F-14s. Just after a quarter past 7:00 in the morning, U.S. signals intelligence aircraft recorded one of the Libyan pilots radioing to his ground controller. “I’m preparing to fire … I’ve fired!” the pilot said. The Soviet K-13 heat-seeking missile — code-named AA-2 Atoll by NATO — was actually reverse-engineered from an American Sidewinder missile recovered from the hull of a Chinese fighter jet struck over the straits of Taiwan in 1958. Though the K-13 and early Sidewinders were better than their contemporaries, they still suffered from the high miss rate of the air-to-air missile of that era and were only likely to hit when fired from the right vantage. “It was still dark and I clearly saw the whole left side of the lead Su-22 lighting up. There was a bright orange flash and then a smoke trail. There was never any doubt about this being a jettisoned drop tank: that Libyan fired a missile. Hank [Lt. Henry Kleemann] was less than 1,000 feet from the Fitters when the missile went under them, then kind of came up towards us before clearing off behind us. It got our attention. The two Libyan fighters then looped for home, fleeing the Tomcats in opposite directions. But the Rules Of Engagement now permitted the F-14 pilots to fire back in self-defense. The far more maneuverable F-14s swung sharply around and behind their attackers, lining up their heat-seeking Sidewinder missiles. Kleemann on Fast Eagle 102 waited for his target to clear the sun before launching one into his opponent’s tailpipe. [I was] just about to squeeze the trigger on this guy when he starts a hard, maybe five-to-six-g turn on the right. I don’t think he knew we were there; we were below and behind and didn’t have radar to trigger his warning gear. So, he starts his right turn and it’s no problem staying with him, but I do have the issue with my only operational Sidewinder: if the Sidewinder wouldn’t work, I would have to go in and gun this guy. So with about five gs on my jet, I squeeze the trigger and out of my peripheral vision to the left, I see the missile come off the rail. However, because I was turning right, the missile went straight for 1,000 feet after launch, apparently going away to the left from me. I could not believe it. So I switch to the gun wondering about the reasons for the missile malfunction, when the Sidewinder unlocked the fins, pulled 45 gs and flashed by, right in front of my windscreen to the right! As fast I could get my eyes back to the right, the missile tracked right up the tail pipe. The explosion was just like in World War II gun camera film: smoke, tanks and parts flying everywhere, directly in front of me, less than half a mile away. My immediate thought was “Oh God, I’ve just shot myself down!” I took both hands on the stick and buried it in my lap, pulling as hard as I could; my neck hurt for days after this. The Libyan pilots ejected. When Muczynski looped around, he thought he saw his opponent’s parachute fail to deploy. However, both Libyan pilots actually survived to be rescued and paraded on Libyan state television that evening, along with an MiG-25 pilot claiming to have shot down six F-14s. But nobody was buying that. Coming six years after the fall of Saigon, the U.S. victory in the aerial skirmish was accorded exaggerated significance at home and abroad, seen as a sort of rebirth of U.S. military prowess. The clash over the Gulf of Sidra also furthered deteriorated U.S.-Libyan relations. In subsequent months, the State Department effectively banned travel to Libya and cut off oil imports. Libya responded by sponsoring more terrorist attacks. Reagan retaliated by sinking Libyan navy ships in the Gulf of Sidra in 1986, then tried to assassinate Qaddafi with an air strike. The raid failed to hit Qaddafi, but may have killed his baby daughter Hana — though recent evidence suggests she may have survived. Then eight years after the first incident, there was a second aerial skirmish over the Gulf of Sidra. On Jan. 4, 1989, four swing-wing MiG-23 Flogger fighters scrambled to intercept a patrol from USS John F. Kennedy. 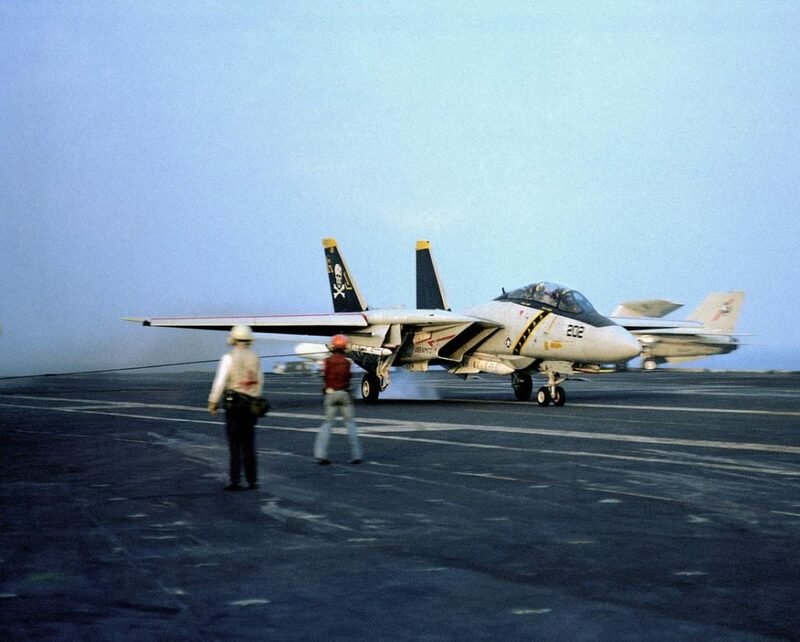 Though expecting trouble, the Navy F-14 pilots attempted to show they were not seeking a fight by repeatedly turning away from the incoming Libyan fighters. However, the Libyan pilots doggedly adjusted their heading to continue closing on the U.S. aircraft. Deciding they were at risk of imminent attack, the F-14 pilots received permission to engage — and promptly launched two medium-range Sparrow missiles from 10 miles away. Both missed, and the Libyan MiGs continued closing in. Despite being equipped with medium-range AA-7 missiles, the Libyan fighters did not appear to lock onto the American fighters. Finally, a third Sparrow hit one of the MiG-23s at a range of five miles, then a short-range Sidewinder splashed a second MiG just above a mile away, causing the other two to withdraw. Though both pilots ejected, neither was rescued. As for the Su-22, despite its relative obscurity in the West, it actually went on to run afoul of U.S. warplanes on many more occasions. Iraqi air force Su-22s saw heavy action in the Iran-Iraq war, where one of their roles involved dropping chemical weapons. Iranian air force F-14, F-4 Phantoms and F-5 pilots claimed to have shot down 42 Su-20s and Su-22s, though the Iraqis insist all of their losses were to ground fire. Then in the 1991 Gulf War, between three and five Su-22s were shot down by U.S. F-15 Eagle fighters. Two others survived a duel with American F-16s. Around 40 Iraqi Su-22s sought refuge in Iran during the conflict-and were promptly pressed into Iranian service. Tehran has spent several decades and millions of dollars attempting put these jets back into service, and effort which finally began to pay off in 2013. Meanwhile, Su-22s passed on to the Afghan Air Force by the Soviet Union eventually fell into the hands of the Taliban — but U.S. air strikes destroyed the few aircraft remaining in flyable condition in 2002. 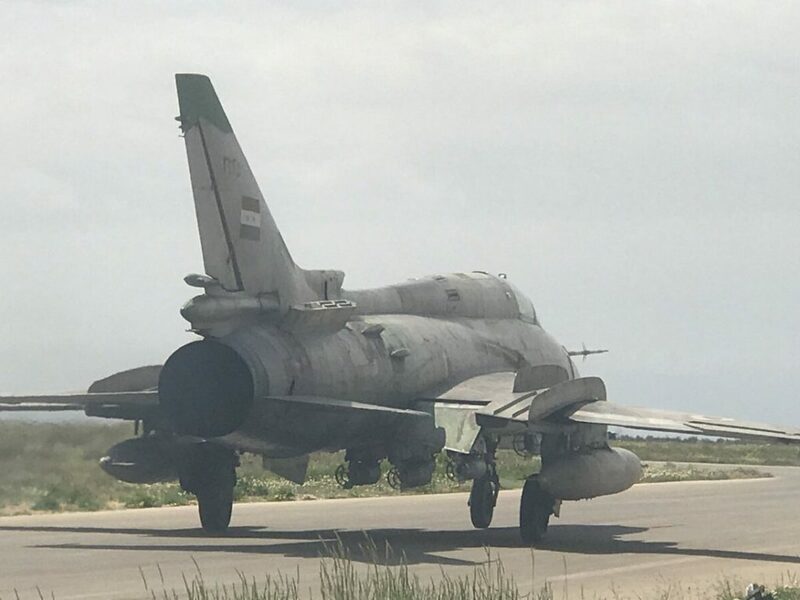 A similar fate befell Libya’s Su-22s when U.S. aircraft destroyed most of the Libyan air force on the ground while aiding rebels in the overthrow of Qaddafi in 2011. However, at least one of the old attack jets survived in a hangar and may have been overhauled for use by the Libyan National Army faction in the Libyan civil war. On April 4, 2017, a Syrian air force Su-22 apparently dropped nerve gas on the rebel-held village of Khan Sheikhoun. This prompted a U.S. cruise missile strike targeting Shayrat air base that destroyed four more Su-22s. The prolific attack jet only succeeded in damaging a U.S. military plane in one bizarre incident in 1992, when two Peruvian Su-22s intercepted a U.S. Air Force signals-intelligence C-130, believing it to be crewed by drug smugglers. The Peruvian planes raked the C-130 with cannon fire, killing one crew member and forcing the transport to land. The incident caused a break in U.S. cooperation with the Peruvian anti-drug campaign. However, the Peruvian Su-22s were just as luckless in war as those elsewhere. Three years later, two were lost in a border war with Ecuador — either to the missiles of Ecuadorean Mirage fighters, or anti-aircraft guns and an engine malfunction, depending on who you ask.